A Tunisian Summer Dish. The vegetables in this dish of course are best in the summer but they are also available year round in most places. Even if it is not summer time, this is actually a very effective way to inject just a little bit of mediterranean colour into a cold wintery day. Traditionally Chatchouka is cooked in one of those small 2 handled, shallow, metal or ceramic dishes, that can be heated over a flame or in the oven. Certainly a 20cm frypan will do the trick. The idea is to cook and serve the Chatchouka in the same dish. That said, if you prefer, any small dish can be used for serving including ramekins. While this recipe is written to cook on top of the stove, if you are using individual serving dishes that need to go into the oven, you can cook the vegetables in a pan on the stove, divide them into 2 dishes once cooked, add the eggs and finish cooking in the oven. If you have access to Padrone peppers, they make for a great alternative to the regular pimientos. An excellent breakfast dish if you have the time, otherwise a great snack or meal for after work - actually just enjoy any time! 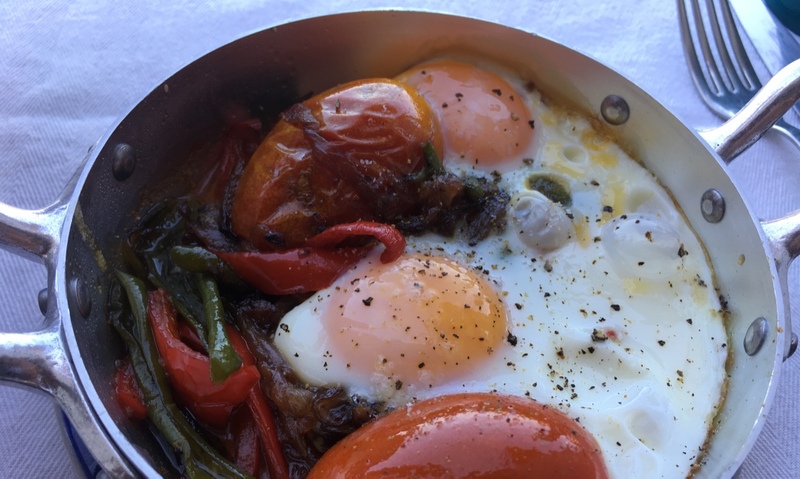 Traditionally Chatchouka is cooked in one of those small 2 handled, shallow, metal or ceramic dishes, that can be heated over a flame or in the oven. Certainly a 20cm frypan will do the trick. The idea is to cook and serve the Chatchouka in the same dish. That said, if you prefer, any small dish can be used for serving including ramekins. While this recipe is written to cook on top of the stove, if you are using individual serving dishes that need to go into the oven, you can cook the vegetables in a pan on the stove, divide them into 2 dishes once cooked, add the eggs and finish cooking in the oven. Spouse and I have been known to fix this after work and set to the one pan with our own knife and fork. If you have access to Padrone peppers, they make for a great alternative to the regular pimientos. An excellent breakfast dish if you have the time, otherwise a great snack or meal for after work – actually just enjoy any time! 100 g Green or red pimentos, or Padrone Peppers – when sliced. Prepare the vegetables:: Peel and finely slice the onion into strips. Rinse and finely slice the pimentos and or padrone peppers or chilli if using. Take care to remove the membranes and seeds. Add the onions once they start to sizzle, reduce the heat, stir, cover the pan and continue to cook gently for at least 10 minutes, stirring occasionally. Do not fry the onions, you want to stew them until they are meltingly soft. Add the pimentos and peppers or chills if using. Turn up the heat a little, once the pan starts sizzling, reduce the heat again, stir and cover. Cook gently for at least 5 minutes until the flesh has begun to soften. Add the tomatoes, once again, increase the heat until the pan is sizzling, reduce the heat immediately and continue cooking until the skin of the tomatoes is splitting. Add the chicken now if using, stir gently to heat through. Season the ingredients with salt and pepper. Break the eggs into the pan over the vegetables. Sprinkle a little paprika over the eggs if using. Cover, cook gently for at least 8 – 10 minutes. The whites of the eggs should be setting but the yolk will still be a little soft. Remove from the heat and allow to settle for a minute or two before serving.